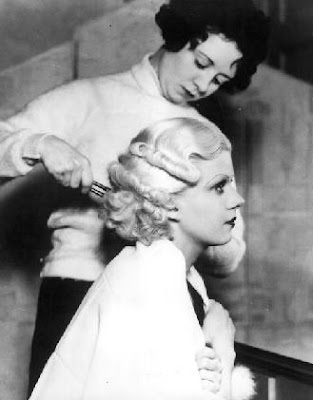 For quite a while now, I have been planning to try to clean up my act where my vintage hairstyle is concerned. 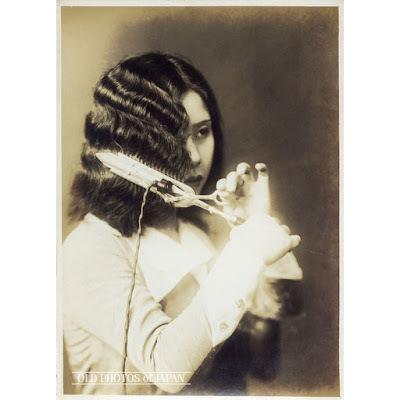 To explain: I am fairly lucky in the locks department, in that I have a natural wave pattern in my hair that is somewhat similar to the Marcel wave look popular in the 1920s and 30s. This wave is even more prominent when my hair is shorter. Given that I have recently discovered I really feel absolutely at home in late 20s and early 30s frocks, this is rather fortuitous. However, it has led me to stop trying out ways to make my hair more polished and era-perfect. Part of this laziness has to do with the fact that when my hair was a tad shorter than it is now, I could get away with loading on the products to create a slicker 20s look. However, even with short hair, I am just really oafish when it comes to doing my own hair. I've always envied girls who can french braid their own hair (like my friend in middle school used to do). That is just not me. Still, I crave a more authentic and finished look. Where I'm at now, as part of my New Year's Resolution, is to strive to keep my vintage style relatively lower maintenance by continuing to work with my natural assets, but at the same time, to complete my vintage look by adding a bit more curl in the right places and by banishing my cowlicks, flyaways, and rogue "wings." 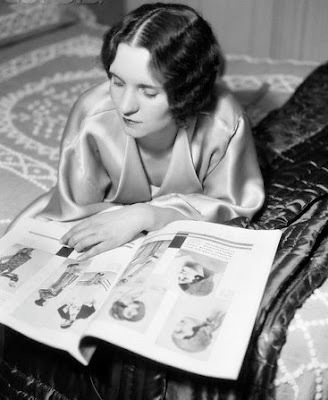 I've purchased the book Vintage Hair Styling, as well as the wonderful Early 1930s Hairstyles from Wearing History on Etsy, and I've feverishly tried to read their instructions and follow the images. However, I found myself feeling the way I used to feel while studying math or physics (two of my worst subjects: like a spatially challenged blockhead. Surely, I thought, there must be a way I can still get an "authentic" vintage look without having to labour with metal hair clamps and without having to fiddle around with rollers (or my own fingers--I can't even do finger waves on myself...unless you can call me getting spitting frustrated and giving myself the finger in the mirror, finger waves!!!). With this reassuring information in mind, I have since purchased a working, unused early 1930s curling and waving iron. I suppose I could have bought a modern one with a smaller barrel, but I thought a vintage one would be fun (pray I don't get electrocuted or burn my hair off or something!!!). There's another one for sale on Etsy, by the way. Long story short: in the next while, I am going to try to "wave" goodbye to my lazy approach to hair and make my crowning glory truly worthy of such an appelation. I'm hoping this new appliance will be the key to tidying up my act. Wish me luck! 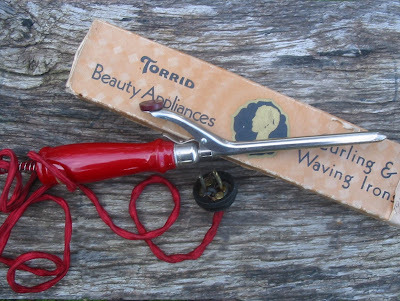 I have a vintage marcel wave curling iron which is basically the original of the 1980s crimping iron! It gives beautiful waves if you apply the proper setting lotion first and of course it helps to have the shorter hair to avoid the 80s look. Wishing you luck honey, sounds fabulous. Make sure you show us the results. that's true dedication that is! oooo i'll have to give that a go with my hot iron! I hope it works out for you! I'm scared of buying vintage appliances because I'm worried they won't work or I'll get electrocuted :/ you're braver than I am! You're so lucky to have a natural wave! I don't have vintage-y hair at all, which makes things like finger waves pretty frustrating to do. I lovelove that kind of look though, and the hot iron is a great idea! Good luck. And pics please!